Chiefs cornerback Charvarius Ward (35) and safety Jordan Lucas (24) tackle Colts tight end Eric Ebron. KANSAS CITY, Mo. — The two transactions that the Kansas City Chiefs made before the start of the season came with little fanfare, mostly because casual football fans probably had never heard of either of them. Jordan Lucas was drafted in the sixth round out of Penn State by the Dolphins and had spent most of his career on their practice squad. Charvarius Ward went undrafted this past April, overlooked by every team several times. He signed with the Cowboys as a free agent, then was shipped to the Chiefs for offensive lineman Parker Ehinger when Dallas decided it needed some help up front. Lucas and Ward became dependable pieces in the Chiefs’ defensive backfield the final two weeks of the regular season. And on Saturday, they helped shut down Andrew Luck and the Indianapolis Colts in a 31-13 victory that sent the franchise to its first AFC title game in 25 years. “I think some of the young guys are maturing right in front of our eyes,” said Chiefs coach Andy Reid, whose team will face the New England Patriots at Arrowhead Stadium next Sunday. His defense had been seen as the biggest vulnerability all season, particularly as the Kansas City offense shattered all kinds of franchise records. The only games they lost came in shootouts against the Rams, Patriots and Seahawks — on all three occasions their defense giving up a boatload of points — and when Kansas City couldn’t stop Philip Rivers and the Los Angeles Chargers in the fourth quarter. It was after that game against the Chargers that Reid made a bold personnel move: He benched cornerback Orlando Scandrick and safety Ron Parker, a pair of veterans who had started all season, in favor of Lucas and Ware, a pair of relatively untested youngsters. Ward was picked on early and came up with several big breakups, and Lucas patrolled the middle of the field like a savvy center fielder. 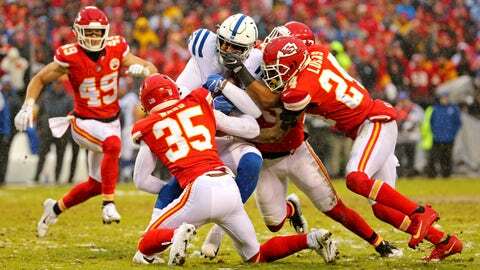 Together, they helped the Chiefs hold Luck to 203 yards passing and kept Indianapolis from scoring an offensive touchdown until late in the fourth quarter. It’s particularly special given the alternative. It’s been a blessing for the Chiefs, too. Part of the reason their defense has struggled all season is the fact that Eric Berry, their star safety and emotional leader, has been sidelined with a heel injury. Berry tried to come back late in the season, only for the injury to flare up again. He was inactive against the Colts. The improved play by the defensive backfield the past few weeks has paid dividends up front, too, allowing defensive tackle Chris Jones and linebackers Justin Houston and Dee Ford to terrorize opposing quarterbacks. Houston had a pair of sacks and Ford had a strip-sack Saturday, and Jones applied enough pressure up the middle to flush Luck from the pocket on several occasions. Now, the Chiefs must step up one more time to earn a trip to the Super Bowl.